A colour photograph of the Grange gates in disrepair. 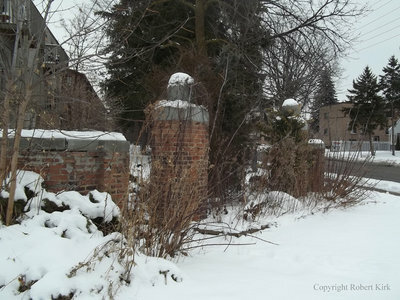 The gates use to mark the entrance of the driveway to "The Grange", residence of Frank L. Beecroft. Kirk, Robert ; Armstrong, James Rogers ; Laidlaw, John B. ; Beecroft, Frank L.
The Grange, December 19, 2013, Robert Kirk. Whitby Archives D2013_011_029.